Local Voice: New Trial for Vincent Simmons! Wow, this is very interesting! I really don’t believe this really happened. 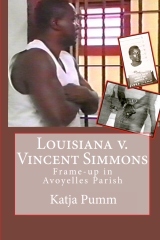 I can believe that he was framed because the whites back then in Avoyelles Parish were very prejudice and most are still. You didn’t hear any of this back in the day. In fact I went to school with these twins Karen and Sharon. We were in the same classes throughout the schools years. I always wondered why they never returned back to school. Small world of wonder! I think he should get a new trial. Framed!